What takes a burglar minutes to achieve could take you weeks to sort out. Home burglary can be a very traumatic experience. But because most home burglaries are opportunist crimes, you can act to prevent the burglar from choosing your house. Sometimes it’s the simple things that are the most effective – a visible alarm, roses surrounding your boundary, a ready supply of money in an obvious place – in saving your home from the worst ransacking. Here’s our guide to preparing your home to avoid burglary. In the BBC programme “To Catch a Thief”, former burglars showed us how they would break in to viewer’s houses. If a house looked secure from the front, they might check the back – particularly if the back fence is sheltered or hidden from public view. If your home backs onto an alleyway or a quiet street then it is worth erecting additional fencing – flimsy trellis (difficult to hang onto), thorny climbing roses or dense shrubs will all deter a burglar. Burglars pointed out that many people store shovels, hammers, crowbars and ladders in their shed, greenhouse or garage – pretty stupid when you think about it. Why? It means that once (s)he’s scaled your garden fence, the burglar has all (s)he needs to get into your home through a window. If you do keep tools in an outdoor shed, make sure it’s equipped with a sturdy lock. Visible alarm boxes (read our article about installing home protection systems) on outer walls of your house will prevent burglars from assuming it’s an easy target. You could also install a movement-sensitive light if your garden is particularly dark. Make sure that you place it on the wall where people cannot reach it. For serious protection, you can install new, secure, burglar-proof (almost) doors. If your back door is vulnerable (perhaps it’s sheltered or hidden), you could just replace that one. If you have a keen DIYer in the household, recruit him or her to help. You’ll want a strong door-frame – replace any mouldy or soft frames – and a door made from material such as fibreglass (timber is too easy to break down). Where you have glass insets, replace the glass with reinforced sheets. 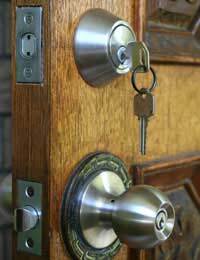 If all this sounds like too much, you could simply replace the locks on your doors. Choose locks displaying British Standard 3621, and look for a five-lever lock (stronger than the traditional three-lever design). Take a few minutes today to photograph your valuables. It will make it easier for you to claim on insurance and to recover them via your local police station. Better still; mark them using a UV pen (detectable under special light) with your postcode. What’s the worst thing a burglar could make off with? Your bank cards? Your engagement ring? Think more: your keys could be the most valuable thing you own! Always take your keys with you, and don’t keep any spares or window keys in obvious places (more about hiding in a minute). When you go to bed at night, don’t hang your keys downstairs – lock up and take them up with you. What about the week’s post? A bank statement might be all someone needs to hack into your account. Make sure you stay on top of shredding, and store your financial records in a locked filing cabinet. What’s the best hiding place for your most prized possession? It’s not the toilet tank (a common hiding place for drugs), or the back of your wardrobe (easy to reach when you don’t care about mess). According to a burglar who spoke to the website Saving Advice, it’s a child’s room. Parents don’t usually trust children with money or valuables – and these rooms are often the messiest! So, if you can find a safe spot – and you can’t store your valuables at a bank or safe deposit – pick this room. If you don’t have children or you just don’t trust them, using a floorboard safe is a great alternative. No, we’ve not lost our marbles! Any burglar will tell you that, once they get into your home, they’re unlikely to leave until they have something valuable. If you hide everything brilliantly, you’ll come home to an upside-down mess. Electronics could be first, but your burglar might keep searching. Instead of having them ransack your home, keep some cash in an ‘obvious’ place – with a bit of luck the burglar will take it and run. Pick somewhere like a drawer in a study, or a box under your bed.